Real estate professionals confirm that of all major home improvements, none is more efficient at adding actual value to your property than to convert unfinished space into finished comfortable living space. This is one of the few home improvements that not only recoup the costs of the renovations but may add more value to the home than you spend on the project. No area is a better target for this kind of home improvement project than the basement, which in many homes offers a tantalizing expanse of space to make over in whatever way you see fit. But the costs of such a project can vary widely, depending on how you approach the project and what kind of features you want to add. If you are handy and can do most of the work yourself, it's possible to do a basic finish job for $6,000 or $7,000. But it is also quite easy when hiring professionals to spend $100,000 for a remodeling project with all the bells and whistles. At the very top end, a large, 3,000 square foot basement professionally constructed and finished can run upwards of $150,000. There is no real agreement on what constitutes an "average" basement remodel, and it's cost. A recent "Cost vs. Value" report from Remodeling magazine indicated that the average cost of a midrange basement conversion job was just over $71,000. These estimates are from general contractors (GCs) who are hiring subcontractors to perform different tasks. But a similar survey by Angie's list gave the average cost as around $32,000 for professional installation. The typical Angie's List user is hiring individual contractors to do the work, rather than using a general contractor (GC). An HGTV survey, meanwhile found that typical DIY basement makeovers run from $10,000 to $27,000. This option refers to taking a basement that is entirely unfinished, then adding the framing, sheetrock, and other elements to turn it into a finished living space. It surprises many people to learn that this is actually a cheaper option that a full-scale remodeling of a basement that is already finished. The reason for this is that it cost more to demolish and rebuild than it does to start from scratch. A basement refinish involves framing, running whatever mechanicals are necessary, installing wall, ceiling, and floor finishes, and painting or wallpapering. On average, the cost for a basic finish job falls anywhere from $6,500 for a DIY job to $20,000 if you are hiring a carpenter to assist, but costs can go much higher for larger spaces. Note that these average costs do not include major plumbing or electrical work. If your space will include a new bathroom or other specialty features, these costs will need to be added separately (see ala carte pricing, below). This option refers to a project that involves taking a basement space that is already finished and altering the layout of the space and completing the refinishing work. This type of remodeling project typically costs between $20,000 and $30,000 for basic labor and materials costs, not counting any extras. In may involve creating spaces such as playrooms, recreation rooms, additional bedrooms, or home offices. If you are willing to do the demolition of existing walls before calling in contractors to do finishing work, you can save as much as $2,000 on the overall cost. Guest suite: This special version of a basement remodel involves adding or remodeling bathroom and installing a kitchenette with cabinetry and necessary electrical upgrades. Expect to pay anywhere from $20,000 to $60,000 for this level of remodeling project. A "Finishing System" project means that you are hiring professionals to install prefabricated wall panels and other components. The drawback here is that there is no way to do any of the work yourself with this type of project since the materials for basement finishing systems are sold only to franchised installers that use proprietary materials and place heavy emphasis on controlling moisture. The advantage is that you are guaranteed a tight, dry, warm space, and your basement will be completed quite quickly. Costs for having such a system installed are about $40 to $50 per square foot, which means that a 1,500 square foot basement could run you as much as $75,000 for a top-of-the-line system. And costs can, of course, go higher if there is substantial wiring and plumbing work done by other contractors as part of your overall project. This is typically one of the most expensive options when it comes to basement remodeling, but also one of the most convenient. If you want to estimate with more precision, it is possible to estimate in a line item fashion, using these ballpark estimates of costs for various elements of a basement finishing project. These estimates assume professional installation in a region with average labor costs. Permits vary greatly from region to region, with typical costs running between $100 and $1500 for basement remodeling. Framing costs about $1 per square foot. Ceilings range from $1 to $6 per square foot, depending on complexity. At the low end, are ceilings that simply must be covered with wallboard and finished. But all too often there is framing work that also needs to be done in order to box in heat ducts or to lower the ceiling for running mechanicals. Floors are often the wild card when it comes to basement remodeling. Costs can range from $300 to $5,000. Vinyl flooring can be laid for $300 to $500; carpeted floors average about $1500; ceramic tile floors cost $1500 to $2000; and wood flooring averages $4000 to $5000 for a basement. Adding a bathroom can add $10,000 to $20,000 rather easily. This cost can be cut in half if you're able to do the work yourself. Foundation work can run about $10,000 if there are substantial repairs needed, such as fixing a shifted foundation. Sealing a basement and foundation against water infiltration costs an average of $4,100, nationally. Installing a sump pump to help keep a basement dry comes with an average cost of $1,100. An egress window, where it is required, costs, on average, $3,500. Egress windows may be required if any room in the basement is used as a bedroom. A wet/bar or kitchenette of modest size can cost between $1,000 and $5,000. For a more full-featured guest apartment kitchen, plan on $12,000 to $20,000. A closet, which is a necessary feature if a basement room is to officially qualify as a bedroom, costs between $1,200 and $1,900. A gas fireplace costs, on average, about $2,000 to have installed. 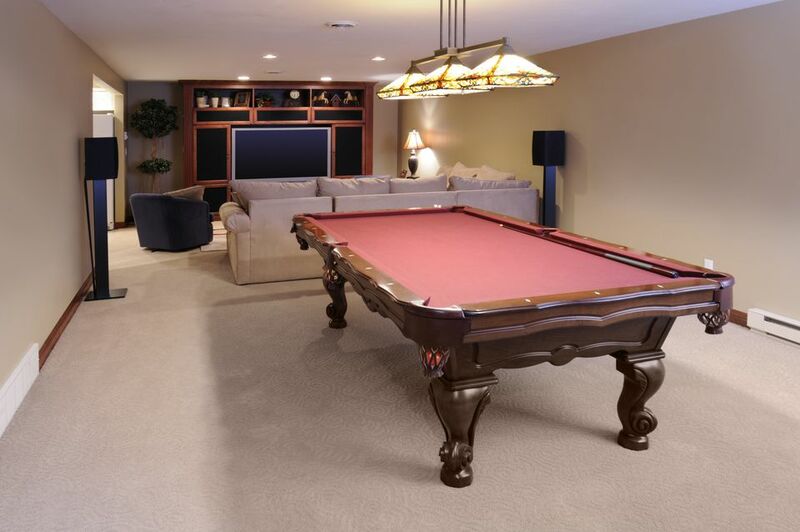 Should You Use Carpet in Your Basement?